Sub-zero Digital painting tutorial. Learn how to paint a character from Mortal Kombat, Sub-zero. Learn from video tutorial and step by step images with instruction. Sub-Zero digital painting tutorial using Photoshop CS5 as a painting tool. This digital painting video tutorial is the most requested from the poll I put on Facebook. I will try to put up more poll so that I would know what people are actually interested in seeing. But half the time, I just want to paint what I want to paint and that’s why I started this blog. But from time to time, painting tutorial suggested popular demand is also nice. Like most of my digital painting video tutorial, I started out with scribble sketchy line. The lines basically a starting point for me to identify structure of the subject I am going to paint, then possibly its pose. After that I will define the solid shape or silhouette using one basic value of the same color first. During this process everything is still monochromatic. When you are painting in monochrome, it is easier to try to figure out the lighting direction. Once I figured out where the light source is coming from, I will paint or render basic three or four basic value to the subject to begin as a foundation or base. One important note, the reason I don’t zoom in much because I am forcing myself to look at the whole picture rather than focus on tiny little detail. Once I have the basic value in place, I will then start to slowly apply color and paint over the value sketch. In this video tutorial, you will see that I use mostly basic Photoshop default round hard edge and soft edge brushes. I try to do that once in a while to get myself back to the basic foundation and not having to rely on custom brushes all the time. As I often said that you can paint decent painting without using custom brushes. Alway focus on trying to get the basic foundation of shapes, value, and color. Once you get that down well, then you will have to learn how to create edges. Here are some information about Sub-Zero, Sub-Zero is the name given to two game characters from the Mortal Kombat series. Being brothers, both of them were born in Earthrealm, and are blue-garbed assassins that descended from Cryomancers, an ancient race of gods possessing the ability to generate and control the powers of ice, which gives Sub-Zero the innate ability to control ice in many forms. A mainstay to the series, Sub-Zero is the only character in the series to be playable in every game, with the exception of Mortal Kombat: Special Forces. The older Sub-Zero first appeared in the first Mortal Kombat game, being replaced by his younger brother in Mortal Kombat II and the subsequent games. It is known that the father of both brothers was a secret operative for the Lin Kuei in the United States. He married an American woman and together they had two sons. Against the will of their mother, the father took the sons with him to move back to China, and as such both brothers were trained as Lin Kuei assassins. This was retconned to both brothers being kidnapped by the Lin Kuei (this was revealed in Sub-Zero’s trailer for the Mortal Kombat 2011). Bi-Han appeared as Sub-Zero in the first Mortal Kombat, while Kuai Liang went by the codename “Tundra”. After Bi-Han was killed by Scorpion during the tournament, Kuai Liang replaced him for the rest of the games – Bi-Han later became the undead Netherrealm wraith, Noob Saibot. The younger Sub-Zero clearly shares many traits with his older brother, and was perhaps too similar to his brother upon his introduction. Like the elder, the younger Sub-Zero gives the impression of being a stern, distant and cold man who goes about his business silently, without attracting unwanted attention. However, as time progressed, Sub-Zero evolved – from what fans labeled a “carbon copy” of his brother – into a man of great integrity and self-discipline. The disparities between the brothers, who were once neutral and almost indistinct from each other, have now grown so large that one could speak of the evil twin syndrome. While the younger Sub-Zero was depicted as a young Lin Kuei warrior who was living in the shadow of his older brother, he has since changed and grown into a warrior who has progressed towards the more humane sides of moral issues. This change in characteristics has not only strengthened him as a man, but has also set him apart from his former Lin Kuei counterparts. The oldest of the two brothers, called Bi-Han (traditional Chinese: 避寒; pinyin: Bìhán), appears in the first Mortal Kombat tournament, in which he was ordered by the Lin Kuei to kill Shang Tsung and take his treasure. He fails to accomplish his mission, and during the time lapse between the first two Mortal Kombat games, he is killed by the specter Scorpion, who sought to avenge his own death. In Ultimate Mortal Kombat 3 and Mortal Kombat Trilogy, he appears as “Classic Sub-Zero”, making him one of three unlockable ninjas (alongside Mileena and Ermac). His biography stated that although he was believed to have died after the first Mortal Kombat, he returned to try again and assassinate Shang Tsung. 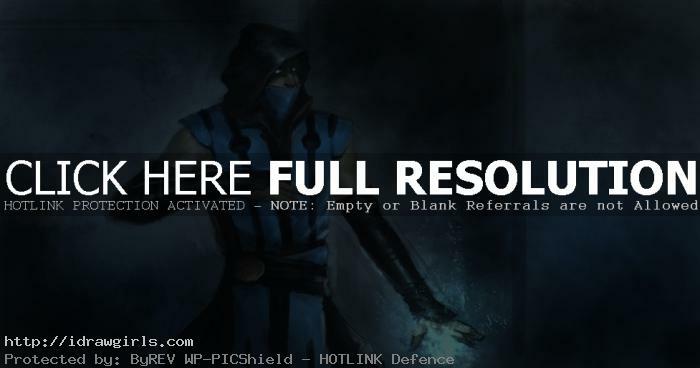 Watch the video tutorial how to paint Sub-Zero from Mortal Kombat. 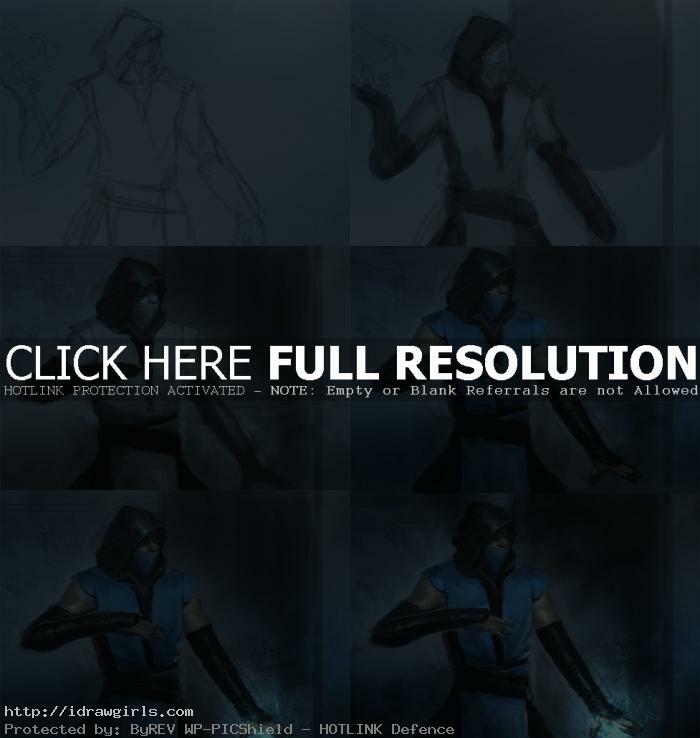 Below are step by step Sub-Zero digital painting tutorial. Watch the video tutorial above for more in depth detail how to paint Sub Zero. I couldn’t quite follow how you did the Blue glowing effect around his hand like the opacity.